A rigorous population genetic analysis looks closely at the data to assess quality and identify outliers or problems in the data such as erroneous allele calls. This chapter focuses on analysis on a per-locus level. While there are statistics that analyze populations across loci, it is important to analyze each locus independently to make sure that one locus is not introducing bias or spurious errors into the analysis. Note: Many of these statistics are specific to co-dominant data. library("poppr")     # Make sure poppr is loaded if you haven't done so already. We can see here that we have a widely variable number of alleles per locus and that we actually have a single locus that only has two alleles, Pi33. This locus also has low diversity, low expected heterozygosity and is very uneven in allele distribution. This is a sign that this might be a phylogenetically uninformative locus, where we have two alleles and one is occurring at a minor frequency. We will explore analysis with and without this locus. Let’s first see if both of these alleles exist in both populations of this data set. ##   Pi33   1.00     .     .
We can see that the South American populations is fixed for one allele, thus it would not be a bad idea to remove that locus from downstream analyses. We can do this using the function informloci. This will remove loci that contain less than a given percentage of divergent individuals (the default is \(2/N\), where \(N\) equals the number of individuals in the data set). nLoc(Pinf)  # Let's look at our data set, note how many loci we have. ## cutoff value: 2.32558139534884 % ( 2 samples ). We can see that it increased ever so slightly for the “North America” and “Total” populations, but not the “South America” population as expected given the fixed alleles at locus P33. ##      P02       .     .     .     .     .     .     .     .     .     .
##      P03       .     .     .     .     .     .     .     .     .     .
##      P04       .     .     .     .     .     .     .     .     .     .
##      P05       .     .     .     .     .     .     .     .     .     .
##      P06       .     .     .     .     .     .     .     .     .     .
##      P08       .     .     .     .     .     .     .     .     .     .
##      P09       .     .     .     .     .     .     .     .     .     .
##      P10       .     .     .     .     .     .     .     .     .     .
##      P13       .     .     .     .     .     .     .     .     .     .
##      P15       .     .     .     .     .     .     .     .     .     .
##      P16       .     .     .     .     .     .     .     .     .     . Here we see a few things. The data set has an average of 2.34% missing data overall. 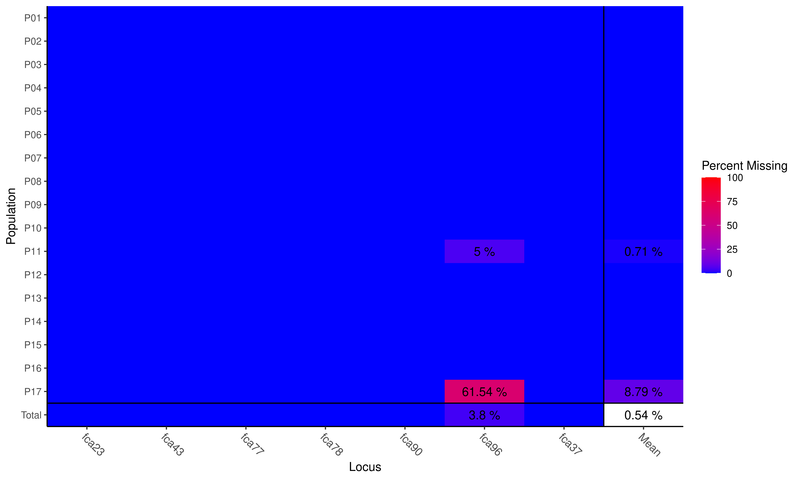 More alarming, perhaps is the fact that population 17 has not been genotyped at locus fca45 at all and that locus fca8 shows missing data across many populations. Many analyses in poppr can be performed with missing data in place as it will be either considered an extra allele in the case of MLG calculations or will be interpolated to not contribute to the distance measure used for the index of association. If you want to specifically treat missing data, you can use the function missingno to remove loci or individuals, or replace missing data with zeroes or the average values of the locus. When removing loci or genotypes, you can specify a cutoff representing the percent missing to be removed. The default is 0.05 (5%). ## Found 617 missing values. ##      P01       .     .     .     .     .      .     .      .
##      P02       .     .     .     .     .      .     .      .
##      P03       .     .     .     .     .      .     .      .
##      P04       .     .     .     .     .      .     .      .
##      P05       .     .     .     .     .      .     .      .
##      P06       .     .     .     .     .      .     .      .
##      P07       .     .     .     .     .      .     .      .
##      P08       .     .     .     .     .      .     .      .
##      P09       .     .     .     .     .      .     .      .
##      P10       .     .     .     .     .      .     .      .
##      P12       .     .     .     .     .      .     .      .
##      P13       .     .     .     .     .      .     .      .
##      P14       .     .     .     .     .      .     .      .
##      P15       .     .     .     .     .      .     .      .
##      P16       .     .     .     .     .      .     .      .
Advanced Users: when scale = TRUE, the color scale will be set so that the warmest color corresponds to the highest value. We only removed two loci. If we wanted to make sure we removed everything, we could set cutoff = 0. ## No Missing Data Found! We only found one individual in population 11. We can see here that both the analytical p-value and permuted p-value show that we have confidence that all loci are not under the null expectation of HWE. This makes sense given that these data represent 17 populations of cats. If we wanted to check what the HWE statistic for each population is, we should first separate the populations with the function seppop(). For this exercise, we will only focus on the analytical p-value by setting B = 0. Now we have one matrix per sample, but all we care about are the p-values, which are in the third column. We can use the functions sapply and [ to loop to create a matrix that only contains populations in columns and loci in rows. [ is used to subset data, and it’s also a function! It provides an easy way to subset a list of data. This output is still hard to sift through. An easy way to analyze this is by visualizing this as a heatmap. Since we only care whether or not a given locus is in or out of HWE, we will thus define an \(\alpha\) value and set everything above that value to 1 so that we can visually detect candidate loci where we might reject the \(H_o\) of HWE. Now we can create a simple heatmap with levelplot. This simple plot shows us loci in rows and populations in columns. 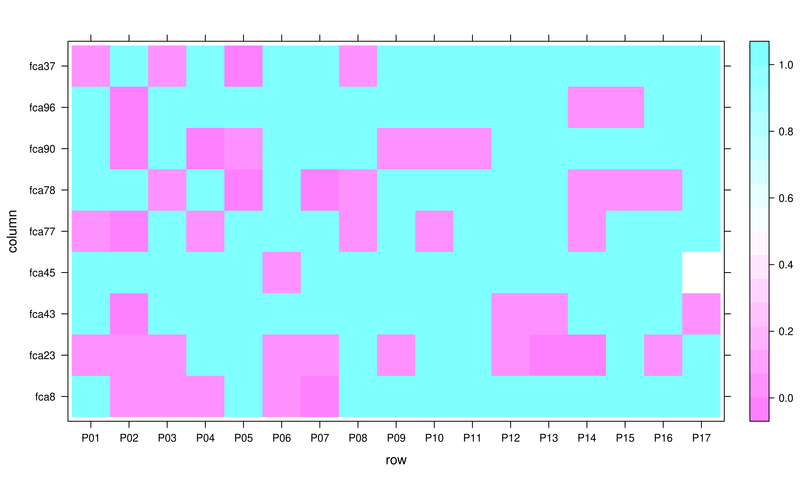 Note, that all loci shown in pink are loci suspected of not being in HWE with \(p \leq 0.05\).